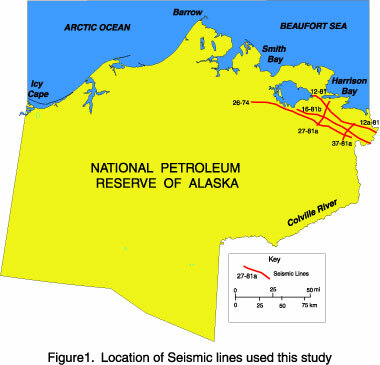 The objective of this exercise is to interpret the of a seismic data set from the northeast corner of the National Petroleum Reserve of Alaska (NPRA) just south of Harrison Bay on the coast of the Beaufort Sea. This exercise includes a study of the geometric relationship of sequences, delta migration, local and regional tectonics, and eustatic signal preserved in the rock record. This data set consists of a grid of five regional seismic lines that cover a linear elongated belt paralleling the Arctic coast (Figure 01). These lines are part of the R8 seismic data shot and processed for USGS and available in the public domain. The geological setting of the exercise is the Colville Basin, which is part of the foreland basin lying to the north of the Brooks Range in Alaska. This basin was initiated in the Jurassic but fill with siliciclastic sediments really accelerated through the Cretaceous and Tertiary. 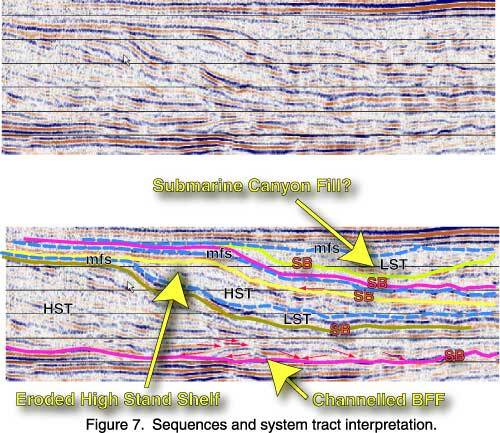 The Cretaceous section (Figure 02) and the associated seismic data set contain very clear examples of prograding clinoforms that provide a unique opportunity for seismic analysis. These clinoforms overlie a set of prominent high amplitude "double reflectors" at around 1.4 to 1.55 seconds (Figure 03). On the basis of the biostratigraphy, and the earlier work by Palmer (1983) and Bird and Molenaar (1991), these reflector doublets are interpreted to represent the Barremian aged Pebble shale. 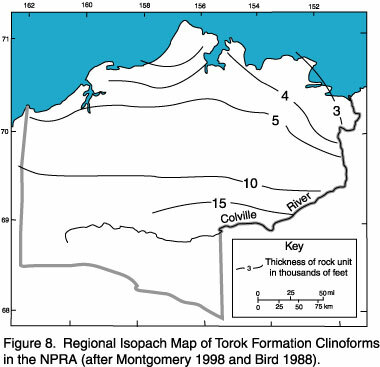 The slopes of the clinoforms in this northeastern portion of the basin are recognized as the Torok Formation, while horizontal onlapping reflectors landward of the crest of the Torok Formation clinoforms are the Nanushuk Group (Figure 03). A chronostratigraphic chart of the Lower Cretaceous sedimentary fill of the NPRA compiled by Palmer (1983) and Bird and Molenaar (1991) interprets the Nanushuk Group and Torok formation as lithostratigraphic units that transgressed time (Figure 04). The biostratigraphic data for the area is poor but, combined with lithostratigraphy, they suggest that the Nanushuk (a sand prone unit), and the Torok (a silt prone unit) young towards the north and east so that the eastern portion of the prograding sedimentary wedge can be assumed to be Cenomanian in age while to the SW they are Aptian. The second and third order eustatic signals on the Haq et al 1987 chart (Figures 05 and 06) should be evident in the Cretaceous section of the NPRA used in the exercises. In contrast some of the higher-frequency (4th order?) sequences may be localized and related to delta migration. 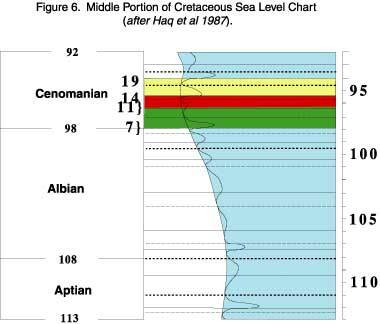 Based on observations of the seismic stratigraphy of the area if the recorded changes of base are the products of eustasy then it should be possible to use the sea level curve developed by Haq, et al, 1987 to "preliminarily" date some of the sequences. 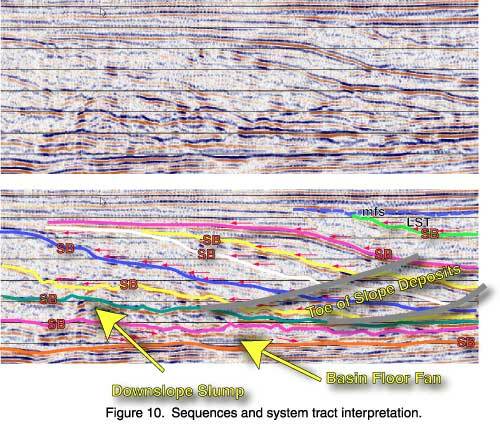 The well data and the seismic data suggests that the Nanushuk Group accumulated in shallow deltaic and fluvial settings, while the Torok Formation collected in delta slope and basin floor fan settings. Individual sequences are interpreted to contain evidence of slumping, basin floor fans, slope fans, and onlapping high stand wedges (Figure 07), and the exercise will examine this. The clinoforms can be mapped and the exercise should confirm that they become younger to the north and east. The internal geometries of these clinoforms suggest an absence of small-scale tectonic control on the area. The exercises outlined below ask that this conclusion be confirmed. 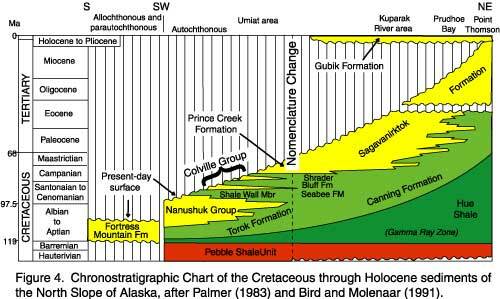 During the Cretaceous, the Colville Basin had a relatively stable tectonic history. There was a slow and constant rate of subsidence, and a concomitant relatively steady overall influx of clastic sediments, though there were short-term local variations in these rates of accumulation. 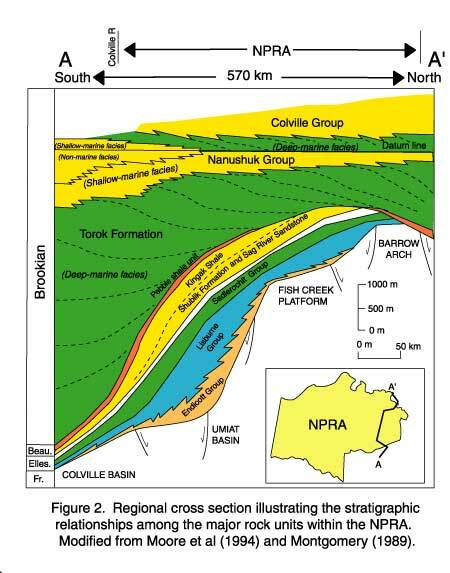 A geological cross section of the NPRA indicates that to the south and west the Lower Cretaceous sedimentary fill of this foreland basin subsided some 6000 meters while to the north and east, in the vicinity of the Barrow Arch, it has subsided no more than 2000 meters (Figure 2). The extensive tectonic subsidence of the foreland basin developed the accommodation of the sedimentary fill of the Colville Basin. The clinoformed sedimentary fill derived from the folded and over thrust Brooks Range to the south and west overwhelmed the reduced accommodation on the adjacent Cratonic fragment beneath the Barrow Arch to the north. The exercise seeks confirmation for this conclusion. Interestingly the Torok Formation is thickest in the foreland basin and thins towards the north while the Nanushuk Group is thickest to the west and thins to the east (Figures 08 & 09) suggesting, and supported by the orientation of the clinoforms, that the basin filled from west to east. 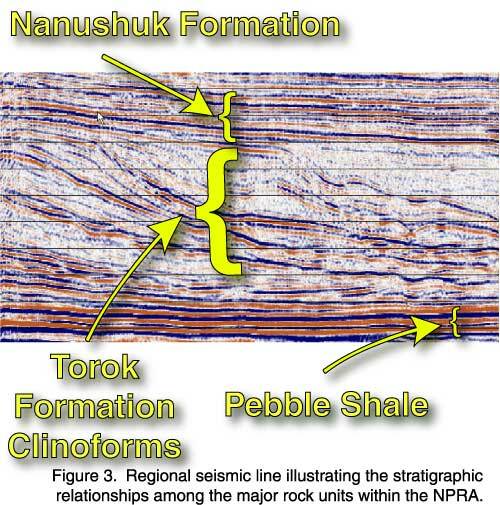 Part of the exercise will be to use the seismic data set to map the position of the intersection of the Nanushuk Group with the crests of the Torok Formation clinoforms. This should establish if in fact the paleo-shoreline was oriented northwest southeast. Another part of the exercise will examine the variation in the thickness and distribution of the clinoforms in order to establish how variable the rate of sediment supply from the Aptian through the Cenomanian was? Variations in the shape and geometries (Figure 10) might be related to delta switching, and migration tied to the shifting of the source areas from the SW.